Link: Mr. Noodle - New York Times. A wonderful appreciation for the creator of, perhaps, the greatest Japanese invention ever! More on Mr. Ando here. Being Rachael Ray: How Cool Is That? - New York Times. "At the stove in her little cabin in the Adirondacks, about a dozen miles from where she graduated from high school in 1986, Rachael Ray spent a night last week making pasta with sweet Italian sausage and canned pumpkin. With her mind more on conversation than cooking, Ms. Ray cut a nice gash in her thumb. She bandaged it up, laughed it off and kept chopping. Even with her wound, wine breaks and the start of a dozen stories she would never quite finish, the dish took half an hour. Her mother, Elsa Scuderi, who is 71 and lives in the cabin, walked in from the garden when dinner was almost ready. "Did you burn something?" Ms. Scuderi asked. "No, mamacello, I didn't burn anything," Ms. Ray replied. She flashed the wide grin that critics of her performances on the Food Network compare to that of Batman's nemesis, the Joker. She's perky-cute, loves to cook and eat and won't break the bank. What's not to love about Rachael Ray? Everything I Need to Know I Learned in the Kitchen. A Vegetarian Haiku in Four Dishes. 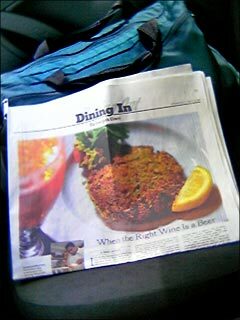 I find myself, more and more, awaiting the Wednesday New York Times with a rapt anticipation usually reserved for Sunday's always excellent edition. Why? For the food of course! Every week there is something to inspire, amaze, teach, and tempt the taste buds. And it always looks so good to see a big 6 column photo! This week its crab cakes!